Somalis have been burying people killed in a huge explosion Saturday in the capital, Mogadishu. The Associated Press reported on Monday that the head of an emergency medical service said over 300 people were killed in the explosion. The Somali government said the number of dead is expected to rise in what has become one of the world’s worst attacks in years. Some families may never recover their loved ones because many of the bodies were burned beyond recognition. "There is no tragedy worse than when someone comes to the dead body of their relative and cannot recognize them," said the mayor of Mogadishu, Tabid Abdi Mohamed. He said the horror of the attack was "unspeakable." Mogadishu's hospitals have been struggling to treat the badly burned victims. The Somali government says it has set up an emergency center to help reunite families. The government has called for three days of national mourning. It also has asked that flags be flown at half-mast as a sign of respect for the victims. Angry protesters, however, condemned al-Shabab. The militant group has yet to comment publicly on the bombing. But the government and terrorism experts strongly believe the group was responsible. "Whether they claim or not claim makes no difference, we know the act that has happened. It’s al-Shabab,” said Abdi Hassan Hussein, a former intelligence officer. He added, “The information we are getting so far shows this is the work of al-Shabab." 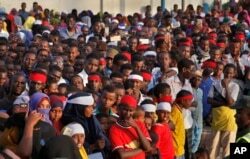 On Sunday, hundreds of Somalis denounced the group at a protest in Mogadishu’s business center, where a truck carrying the bomb exploded. Some demonstrators wept when they saw the damage caused by the explosion. Angry protesters gather near the scene of Saturday's massive truck bomb attack, near the presidential palace, in Mogadishu, Somalia, Oct. 15, 2017. Maryan Abdullahi just finished Benadir University where she studied medicine. She left her voluntary work at Benadir hospital Saturday and was waiting a bus when the bomb exploded. She died immediately. Her mother called her daughter's telephone number as soon as she heard about the explosion. She told VOA Somali, “I called her number immediately, but someone else answered and they said the owner of the phone died." Abdullahi’s father flew from London on Saturday to attend his daughter’s graduation from the university. He arrived in Mogadishu Sunday morning and attended her funeral instead. Also killed were five members of the same family who were operating a clothing business. Hundreds of people were wounded in the attack. One of them is VOA’s reporter in Mogadishu, Abdulkadir Mohamed Abdulle. Abdulle suffered injuries to the neck, hand and burns throughout his body. But he was in good spirits when he spoke about his condition. Abdulle has memories of the attack. Harun Maruf wrote this story for VOANews.com. George Grow adapted this report for Learning English. Hai Do was the editor.